Martha P. Nochimson, author of “David Lynch Swerves.” Courtesy of Martha P. Nochimson. 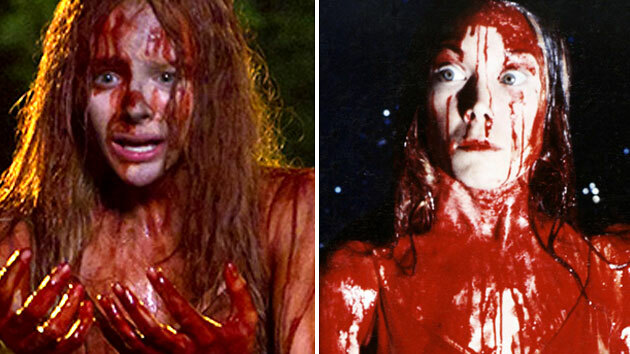 Cinephiles, prepare to have your minds blown. The new book by acclaimed film critic and writer, Martha P. Nochimson, does a brilliant job of altering and revitalizing our understanding of arguably America’s greatest living filmmaker. 16 years after releasing “The Passion of David Lynch: Wild at Heart in Hollywood,” Nochimson explores the controversial, widely beloved auteur’s second-stage films in “David Lynch Swerves,” a must-read for any serious scholar or fan of the director’s incomparable oeuvre. In this provocative, hugely entertaining book, Nochimson reveals how Lynch’s interest in quantum mechanics and the Holy Vedas of the Hindu religion provide a key to understanding his later work—namely, 1997’s “Lost Highway,” 1999’s “The Straight Story,” 2001’s “Mulholland Dr.” and 2006’s “Inland Empire”—on an exhilaratingly new level. 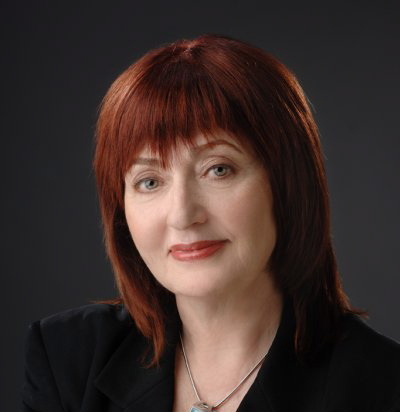 In this exclusive interview, Nochimson chats with Indie Outlook about her fascinating theories regarding Lynch’s work, her enlightening conversations with physicist David Albert and the invigorating, often overlooked message that the director wishes to convey to his audience. Q: When I first saw “Mulholland Dr.”, the only other Lynch film that I had seen prior to it was “The Straight Story.” Though “Mulholland Dr.” left me feeling profoundly frustrated, it haunted me for the next six months until I decided to see it again. It is currently my favorite film of all time. Q: That’s the same experience I had with “Mulholland Dr.” It was beckoning me back and proved to be enormously rewarding upon subsequent viewings. A: I think this is very much to your credit because a lot of people want to see a movie and understand everything immediately. If they don’t, they just say, “I’m finished with this, I’m not coming back,” but you did come back. That’s what it’s all about. A lot of writers just want to recap the plot and if they don’t get the plot, they walk away. It marks them as completely incompetent. It’s a source of great frustration to me when bad critics pollute the industry. As I see it, Lynch is the greatest living American director. Q: According to your book, Lynch is encouraging his audience to tap into the unrealized potential in their lives while avoiding the structures that limit their growth as individuals. Would you say that’s an accurate description? A: You’ve got it perfectly, and let me tell you, very few do. Even for “The Passion of David Lynch,” people would come up to me and say, “I love your book,” and describe what they thought I was saying, and I’d think, “Where did you get that from?” But you got it. That’s exactly what Lynch is about. I think I knew it from the first time I saw “Blue Velvet.” I didn’t know how to talk about it, but I think I knew it from the first time I saw that movie. The first thing I realized was that Lynch was taking us to the edge of what we ordinarily knew and asking us to peer beyond it, and eventually, to go beyond it. And then he sort of builds from there. I would say that from “Lost Highway” on, he’s becoming more insistent on the necessity that we explore the possibilities because the alternative is horrible. Q: Hollywood will occasionally take a gamble on fresh talent and then immediately place it in generic vehicles that kill off any semblance of spontaneity and creativity, which is what “Mulholland Dr.” seems to be about. A: Completely. Creativity is life and death to him. He once said to me that if he had to make a movie by committee, he would kill himself, and I think he would. He wasn’t joking. Creativity is very important to him. He believes that every one of us is an artist. So for me, what happens to Betty [the heroine] in “Mulholland Dr.” is what happens to any of us once we accept a vista of fear and certainty, and we can no longer try new things. A chef sits in his kitchen and says, “I’m going to do this,” and if he can’t do it, he’s going to die a little bit. The more he can’t do it, the more dead he will become. Lynch has a marvelously optimistic point of view. He thinks there are dead people all around us who don’t have to be dead. That part of Lynch means everything to me. I totally identify with that in my own life, in the life of my children, in the life of my friends, my husband, my colleagues, all the people in the industry that I’ve had interesting experiences with. It’s exactly what life is all about. I do not feel the necessity to believe in the Holy Vedas as anything but metaphor. He may believe in them as holy text representing reality, but I think that’s completely irrelevant to his movies, and I think he would say the same thing. When anything he takes as artistic material appears in his film, it’s not about what he believes. His films are poems. It’s the same reason why I can read “The Divine Comedy” with great love and appreciation even though I am not a Catholic. I see what Lynch’s vision is, and strangely enough, his vision is not far off from what most of us believe now. It’s just that we don’t believe it literally or many of us don’t. Some do. Q: Your book includes a fascinating transcript of conversations between you and physicist David Albert. How did he shape or influence your understanding of quantum physics? A: After I saw “What the Bleep Do We Know?”, I spoke to a colleague of my husband’s, who is a physics professor. I asked him what he thought of “What the Bleep,” and he practically foamed at the mouth. At that point, I realized physicists hate that movie. There might be one or two somewhere who don’t, but I haven’t run across them. He hated that movie so much that he refused to talk to me about it. He presumed that I loved it, which was not at all true. He said to me that there was a scientist in the movie who felt that he was misled about what the movie was going to be about. He had sued to get himself out of the movie, but he was not able to do it. So I asked, “Who is it?” and he refused to tell me, which I thought was interesting. I decided to figure it out myself, and came to the conclusion that it was David Albert. I found him at Columbia, and told him that I was writing a book about David Lynch and the influence of physics on his work. He was thrilled. First of all, he adores David Lynch. Second of all, his professional life, in many ways, is about how physics impacts our lives in regards to philosophy and art. He’s not just about the physics itself. He’s interested in its cultural dimensions and extending the boundary of physics past physicists, so he was my perfect man. What he did for me was very important, but it might not be what you’re expecting. If you wanted to, you could find out the basic principles of quantum mechanics in the same way you found my book. Just type in quantum mechanics and you’ll get a whole list of books. The first three that you pick are going to tell you what superposition is, what entanglement is, and a whole bunch of other things. I could do that, but I still can’t do the math. It’s very complicated. If I decided to devote a couple years to it, or maybe even less, I could do the math, but that wasn’t what I needed physics for. I don’t want to become a physicist and conduct experiments. What I needed was somebody I respected, and I respected Albert almost immediately because he’s so brilliant and eloquent. He’s not afraid to open himself up and he’s lovely in that respect. At the same time, he’s a very hard-nosed scientist. He hates “What the Bleep” because he feels that it’s junk science and I do too. I needed him to tell me not what the principles of physics are but what the different schools of physics believe about those principles, because as in all disciplines, there are arguments. I needed to know what was generally accepted by everybody and what was up for grabs. He was able to tell me which positions were respected by credible physicists, which were considered marginal and which were considered crackpot. So that was very exciting and interesting. He also pointed me toward the artistic judgments that people are currently making when talking about the relationship between physics and the arts. For example, people who are interested in the implications of quantum mechanics in the arts see those implications very clearly in Kafka and Beckett. When he showed me that glorious passage [posted below] from Arthur Eddington’s “The Nature of the Physical World,” brilliant megawatt lights just came on in my mind and I went, “Oh my god, this is it.” Long story short, Albert was one of the people who gave me confidence to follow my instincts, and he also helped me draw the line so that I didn’t go off into crazy stuff that was irrelevant and irresponsible. Q: It’s interesting how certain terms from the monologue delivered by Grace Zabriskie’s Visitor #1 in “Inland Empire,” such as “marketplace” and “palace,” are utilized throughout your book to illustrate key theories, such as the marketplace mentality that drives characters to their doom. A: What you see in the book is the end of the process. I didn’t see her monologue and say, “Oh look, here’s the framework for my overarching thesis.” The way I work as a critic is the way David works as an artist. A bell rings or the lights blink or something happens when I see the scene and I know there’s something in there that I need to figure out or that I need to get into. Her dialogue about the marketplace and the palace and those incredible little Polish stories about “a little girl who goes out to play” have no reason to be in the movie at all unless they are opening the door to something. That’s where it begins. I get a little insight here and there, and I begin to start putting it together. I got the confidence to put it all together after my interview with Lynch in March 2010. We did talk about the words “palace” and “marketplace” and I said to myself, “I’m not making this up. These words mean thus and so to him.” Visitor #1 was the beginning in a way, but I didn’t start from there. Q: Just the way Lynch frames that scene inspires the audience to hang on her every word. A: And let’s give [Zabriskie] credit. What a performance! That woman can do anything, and she works so well with him. I cry because Lynch hasn’t made another movie in so long. I want to see him work with these people. Almost every actor that he works with turns to gold. Ray Wise was a “learn your lines and don’t bump into the furniture” kind of actor, but in “Twin Peaks,” he suddenly became this amazing person. And of course, Kyle MacLachlan has never been able to reach the heights he reached with Lynch. What a waste that these actors are floundering out there with all the crap they have to do. Q: Do you think “Inland Empire” might be Lynch’s last film? A: There is a chance, but no certainty. In fact, I talked to him about this. There’s an actress that I used to meet with every year named Sylvia Miles. She was in “Midnight Cowboy,” and is such an incredible, intuitive woman. Lynch said to her on occasion that he would use her in a movie, so I asked her about it, and she said, “He’s not making any more movies.” And I asked, “Why do you say that?” and she said, “He’s too involved with his foundation.” When I met with David in March 2010, I told him what Sylvia said and that I told her that couldn’t possibly happen. He just looked at me and said, “Yes it could.” I said, “You wouldn’t make another movie? !” and he said, “Well, I might, but I might not.” And I said, “Well, I’ll be voting for might.” [laughs] I can’t stand the thought that he wouldn’t make another movie. It means so much to all of us. Q: He elicits the best out of his collaborators. When I interviewed Piper Laurie, she recalled how excited she was to return to “Twin Peaks” under the guise of Fumio Yamaguchi. Though her cast mates were initially fooled by the stunt, the only person who had no idea Laurie was Yamaguchi until she started taking off her makeup was her frequent scene partner, Jack Nance. A: You’re kidding! [laughs] Oh god, I would’ve given anything to have seen that moment. I interviewed him for “Passion of David Lynch.” He’s the most emotional person you could possibly imagine. You can just imagine his head exploding in front of everybody. Lynch found everything in Nance that could be brought out onscreen, and of course, he died so young and so horribly. He was a sweet, sweet man. A: [laughs] I saw a screening of “Lost Highway” at the American Museum of the Moving Image in Queens, and Lynch was there for a Q&A. Somebody gets up and asks him, “Do you really know what happened on the lawn that night?” And Lynch says, “Yes,” and after a very long pause adds, “and so do you.” And he meant it. He thinks—and I agree with him totally, absolutely and completely—that underneath all the bad training so many people have had in reading literature and hence, in reading movies, is the place that reacts to art, and in that place, without words, we all know what these things mean. It just gets screwed up when we try to think about it, and the job of the critic is to take the obstacles out of the way of that place that knows what’s going on. Q: I don’t necessarily feel like there are any waking moments in “Mulholland Dr.”, though I feel your interpretation of the film as “the culture’s dream” could be intertwined with the character of Betty (Naomi Watts) in regards to that “two in one” idea. A: That’s for sure, but Diane [also played by Naomi Watts] is part of that dream too. I believe that it’s all a dream. The creator of “The Sopranos,” David Chase, also agrees with that idea. He feels that life is a dream within a dream, and that’s what “The Sopranos” is really about. I see Betty as a girl who’s got it all. She’s blonde, she’s blue-eyed, she’s exactly what the culture wants. She’s also fantastically talented. We don’t know this until she does her audition scene, and yet it all gets f—ked up, pardon my French. Why didn’t she make it? She’s not dreaming that she’s Betty, she is Betty. But Betty lives within a dream of a culture that doesn’t allow for the creativity that she shows during that audition. That’s what shuts everything down. The transition between the first part of the film and the last third is what happens to Betty after her dream dies—well not her dream, because she is the dream. The dream isn’t apart from reality. Reality is comprised of society’s ideas about reality, which would be okay, except that what we’ve all been socialized to believe is very destructive. Everyone in that movie is destroyed because creativity is life and death. People keep telling stories about characters having dreams and waking up. You watch it and it’s very entertaining and then you don’t come back to it. When you watch Lynch’s films and don’t understand what the hell he’s doing, then you know that something is going on there that means that you have to challenge everything in you that you think you know. We all know that we have dreams and we wake up, and that’s not it. I was really shocked to see how many critics—good critics, very well-educated people—bought into that nonsense. Of course it’s not a dream and she wakes up. Who would care about that? Q: It’s the dream of certainty embodied by culture itself. Do you feel any other filmmaker in America is operating on Lynch’s level? A: Well, they are so pressured, like Kingsley [the director played by Jeremy Irons] in “Inland Empire.” They are so pressured to operate on a non-artistic level. What is Kingsley thinking about all the time? He’s thinking about awards, but he doesn’t know how to create. Maybe he once did, but he doesn’t anymore, and it’s only because Nikki [the actress played by Laura Dern] has the courage to move past the barrier of certainty that he directs a movie that is beyond his wildest dreams. I’ve written for television and I know what the business is like. It’s really a miracle when anyone gets beyond the paint-by-numbers mechanistic narratives because the pressures are so heavy on them. I don’t view Kingsley with contempt or disgust. He’s a creature of his culture. Q: Nikki triumphs where Betty failed in “Mulholland Dr.”, which allows her to bask in the joy of creation in that wonderful end credit sequence. A: Well, don’t sell yourself short. It takes a great deal of courage to follow the film through to it, and lots of people couldn’t. Q: And yet, as you so beautifully convey in your chapter on “The Straight Story,” the illusions that guide Alvin Straight (Richard Farnsworth) enable him to reach his destination, rather than entrap him in a lost highway. A: The key is that Alvin is old. The fire has been burnt out of him, and the things that drive everyone else crazy in Lynch’s other movies don’t get to him. Age has brought that reward. But even so, when Alvin finally gets to his brother, what struck me was how detached they remain from each other. They don’t embrace, they barely say a word to each other. So Alvin got there but he didn’t quite get there. He lives within very stringently drawn boundaries, but he’s got enough goodness in him and he’s old enough so that somehow, it works. It’s a miracle, but we can begin to see why it works for him and it doesn’t work for Betty. There are so many possible ways of looking at the world. I’m floored by Lynch, and if you’ll forgive a sentimental statement, I thank God for him. I thank God for all great artists. I don’t think we have too much else in the world to sustain us but great art. It really is a pleasure talking with someone who loves Lynch so insightfully. So many people love him and yet, as I listen to them talk, I’m thinking, “Oh my god, keep smiling.” [laughs] I have all the hope for your generation. I think you guys and girls are freed of a lot of the things that are blinkering previous generations. I mean, you have your problems too, [laughs] but it’s a delicious thing to hear you. 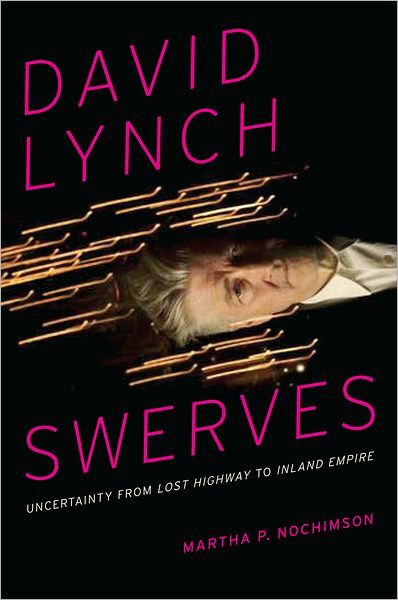 “David Lynch Swerves” was released on March 15th and is available in stores and online. For more information on Martha, visit her official site. “David Lynch Swerves” by Martha P. Nochimson. Courtesy of University of Texas Press. I am standing on the threshold about to enter a room. It is a complicated business. In the first place I must shove against an atmosphere pressing with a force of fourteen pounds on every square inch of my body. I must make sure of landing on a plank traveling at twenty miles a second round the sun—a fraction of a second too early or too late, the plank would be miles away. I must do this whilst hanging from a round planet headed outward into space, and with a wind of aether blowing at no one knows how many miles a second through every interstice of my body. The plank has no solidity of substance to step on; it is like stepping on a swarm of flies. Shall I not slip through? No, if I make the venture one of the flies hits me and gives me a boost up again; I fall again and am knocked upwards by another fly; and so on. I may hope that the net result will be that I remain about steady; but if unfortunately I should slip through the floor or be boosted too violently up to the ceiling, the occurrence would be, not a violation of the laws of Nature, but a rare coincidence. These are some of the minor difficulties. I ought really to look at the problem four-dimensionally as concerning the intersection of my world line with that of the plank. Then again it is necessary to determine in which direction the entropy of the world is increasing in order to make sure that my passage over the threshold is an entrance, not an exit. Verily, it is easier for a camel to pass through the eye of a needle than for a scientific man to pass through a door. Tags: Arthur Eddington, Blue Velvet, David Albert, David Chase, David Lynch, David Lynch Swerves, Grace Zabriskie, HollywoodChicago.com, Indie Outlook, Inland Empire, Jack Nance, Jeremy Irons, Kyle MacLachlan, Laura Dern, Lost Highway, Martha P. Nochimson, Martha P. Nochimson Interview, Matt Fagerholm, Midnight Cowboy, Mulholland Dr., Naomi Watts, Piper Laurie, Ray Wise, Richard Farnsworth, Sylvia Miles, The Divine Comedy, The Nature of the Physical World, The Passion of David Lynch, The Sopranos, The Straight Story, Twin Peaks, University of Texas Press, What the Bleep Do We Know?